This article appeared on the Independent website on Tuesday 1st August 2017. 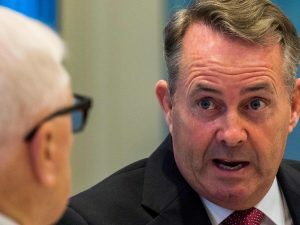 After a week of telling Americans how free and open the world should be, it might seem a little inconsistent that the following weekend Trade Secretary Liam Fox was calling for the end of free movement of people after Brexit. The free movement of people has always worried those who support the unrestricted rule of the super wealthy, and with good reason. Free trade, said Fox, is “the rising tide of affluence that lifts all boats” because “prosperity is achieved when we are at liberty to pursue our own interests”. That is, unless you happen to be 99 per cent of the world’s population. Because, for Fox, concepts like liberty, freedom and openness only apply to the wealthy. The 1 per cent and their investments should be free to go where they want, when they want, and do what they want. The type of trade deals which Fox wants to negotiate will try to further remove those standards and regulations which protect the environment and society from the rapacious desire of big business to make greater profit. Chlorine-washed chickens are just the tip of the iceberg. The only protection that isn’t being threatened is the right of the wealthy and investors to make money – hence the “corporate courts” in such deals, that allow foreign investors to sue governments for doing nearly anything which might affect their profitability. But what of the people whose lives are turned upside down by this freedom of money? Over the weekend Fox made clear what he thinks – they should stay where they are. After all, if corporations can’t ensure people are imprisoned in their nation states, why would people keep working for dirt poor wages and in conditions which would be totally unacceptable in the home country of their employer? Freedom of movement of people reverses this proposition. It finally gives ordinary people rights – to organise for better conditions and better pay. No wonder Fox hates European free movement. It’s one of the only immigration systems in history where the ability to move is a human right, not a product of economic necessity, forcing people to meet the “needs” of business. While much could and should be said about the EU’s own barbaric immigration policy, the answer should not be to rescind these rights of ordinary people, but to extend them. The free movement of people would massively increase the incomes of those moving, would ensure significant amounts of wealth, skills and talent would be reinvested in poorer countries, and would allow foreign workers to benefit from all the normal labour regulations that exist in the country they move to. For Fox, this is bad news, because their primary concern is not about reducing poverty, but serving the interests of the already wealthy. Meanwhile, those on the left must stop buying the propaganda that free movement of people is a big business plot to undermine workers’ rights. This is an echo of those who, one hundred years ago, argued for excluding women from the labour market because it undermined male workers’ pay and conditions. Even to the extent that it was true, progressives must never be opposed to extending rights to people. Our call is simple, and quite the contrary of Dr Fox’s: “Regulate wealth and free the people”.